“Dobryy den’,” I said to the Dorothy Hamill-coiffed customs agent. I was eager to practice the little Russian I knew. She must not have heard me because she didn’t respond to my greeting. “Dobryy den’,” I repeated, this time with a smile. Maybe I was pronouncing it wrong. The third time I wished her good morning, I got an icy stare, alerting me that this had nothing to do with volume or pronunciation. I was just supposed to keep my lip zipped. 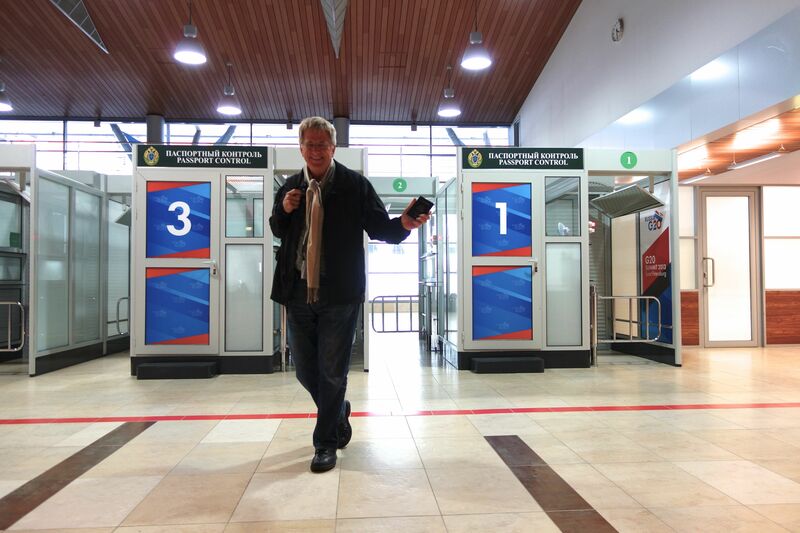 Rick and I made it through Russian customs without incident…thankfully. Seconds passed like honey through a sock. I watched nervously (though I tried to play it cool) as the agent index-fingered my passport, looking for my visa and anything that was amiss. My heartbeat and my breath were the only two sounds I could hear. When I finally heard the ca-chunk of the Russian stamp being marked in my U.S. passport, I thought, “That is the most beautiful sound in the world.” The second most beautiful sound: my partner Rick Steves’ passport being stamped. 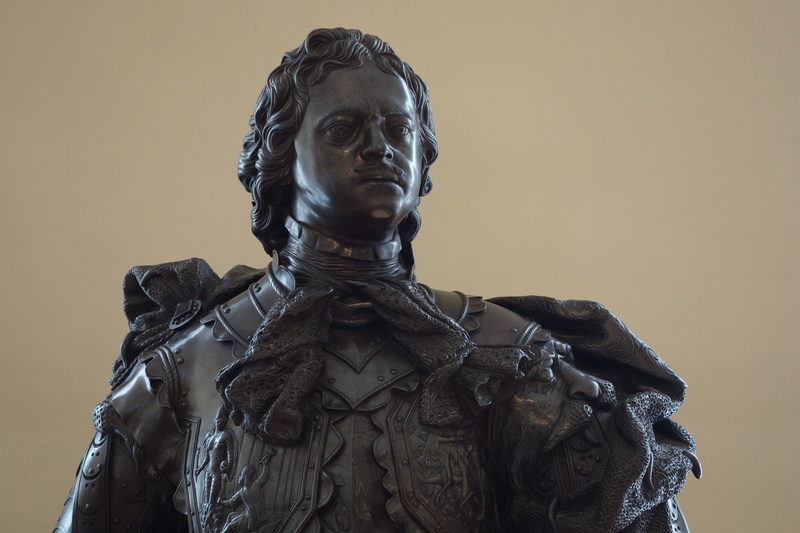 Peter the Great, founder of St. Petersburg (named for his patron saint). With that one incident, I braced myself for five bleak and dreary days in St. Petersburg. To be honest, I hadn’t done enough research on SP prior to this trip and was relying on conjured images, shaped by movies, TV, and stories that had somehow crept into my brain. Here we were, at the height of summer, and I was envisioning people outfitted in fur hats and wool coats, shielding themselves—if not from the cold–from the general fog of misery can weigh down a society. I imagined decrepit buildings with ten families sharing one apartment and pictured robotic lines of SP citizens waiting and waiting for whatever it is that Russians wait in line for. It’s an ignorant way to form a perception about a city–particularly when you’ve never been there before, and despite my best efforts to arrive with an open mind, I felt like I was merely looking through a crack in a door. But as we made our way farther and farther from the cruise terminal and into the heart of the city, I felt like that door was about to be kicked wide open. 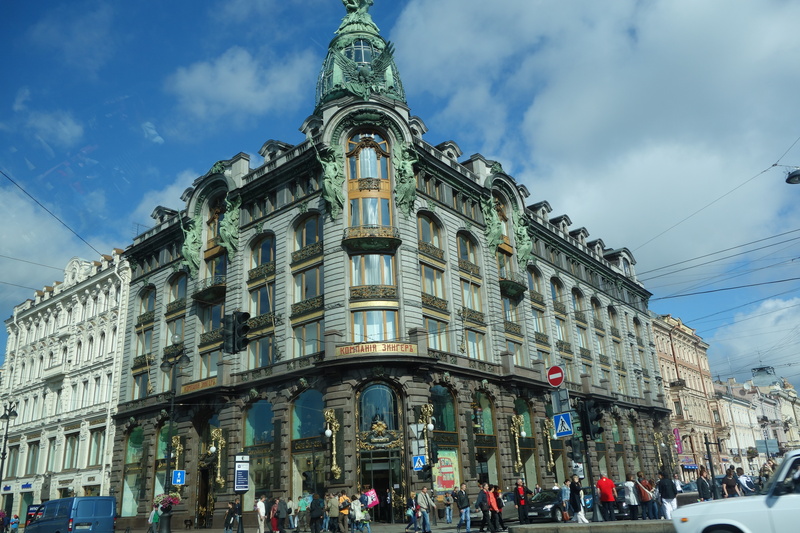 The Singer Building on Nevsky Prospekt was the former Russian branch of the Singer Sewing Maching Company and now houses the House of Books and an upstairs cafe with a million ruble-view. After settling into our friend Steve’s gorgeous apartment (happily not a communal one), we headed out and walked everywhere. Our first two guides (one guide per day) were relentless about showing as much as possible. The city is immense and trying to comprehend scale is an exercise in futility. But walking as much as we did helped us more easily find our physical, cultural, and historical bearings. Although vast, it somehow began to feel manageable. 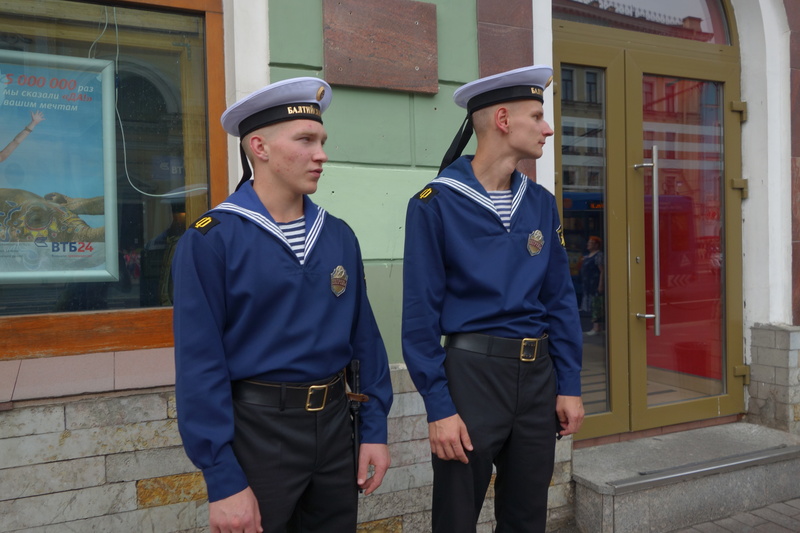 Going from one neighborhood to the next and re-encountering sites from different vantage points produced a sense of familiarity and made me feel increasingly at ease in this former Imperial capital of Russia. It impresses me how much of its 310-year history is retained via its architecture and how modernity seems blend itself so easily with tradition. With no ship nearby, these two look a little out of sorts. Kudos to anyone who can read this. I’ll give you a hint: does “Pavlov” ring any bells? As Rick took diligent notes from our guides, I was like a kid in a candy store, taking photos of everything that caught my eye: toothless babushkas (head-scarfed, elderly Russian women), young men in military uniform, the vibrant colors of the Winter Palace, divine mosaics decorating Orthodox (former) churches, and Cyrillic letters that reminded me that having a guide where you don’t speak the language is a blessing and sometimes a necessity. 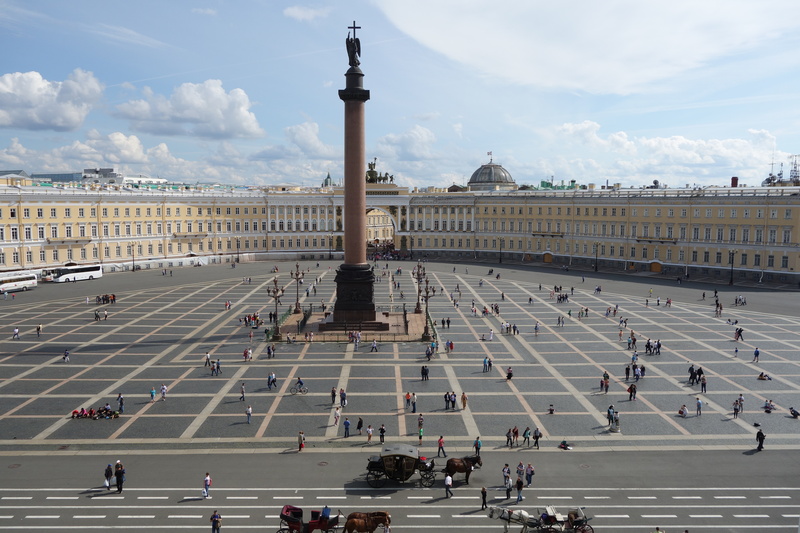 A majestic view from the Winter Palace onto Palace Square that would make any St. Petersburg citizen proud. 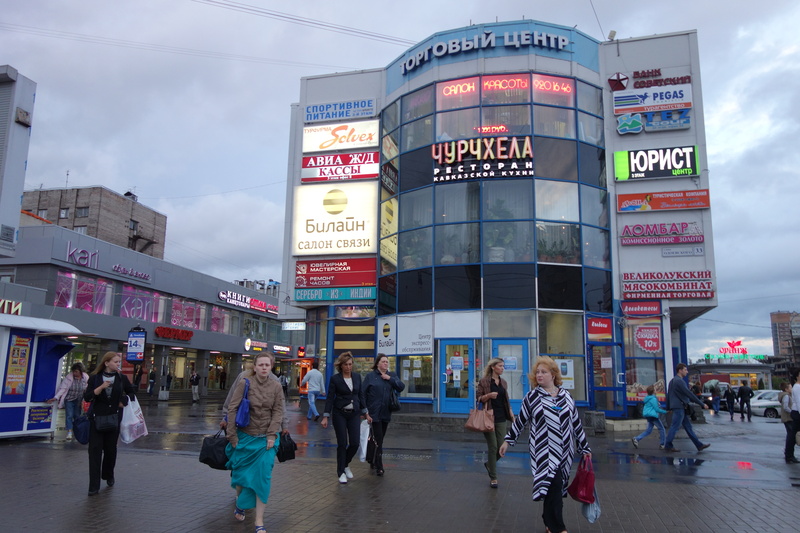 Surrounded by strip malls, Cyrillic neon signs, this St. Petersburg neighborhood feels simultaneously urban, gritty, modern, Western, and utterly Russian. I imagine that SP citizens must swell with pride when they think of their hometown. Modeled after the canal-strewn layout of Amsterdam, it was the jewel of Tsar Peter the Great. Its style has evolved from Petrine Baroque through Empire, Elizabethan Baroque, and Neoclassical, Romanticist, and Constructivist styles. It has suffered catastrophic fires, revolutions, siege, and Stalin. And now, more than 20 years after the fall of the Soviet Union, St. Petersburg is a thriving hub of culture, industry, new money, and rapid change. This bustling city is monumental and accessible, historic and new, Eastern and Western, conservative and edgy, Russian and European…all at the same time. 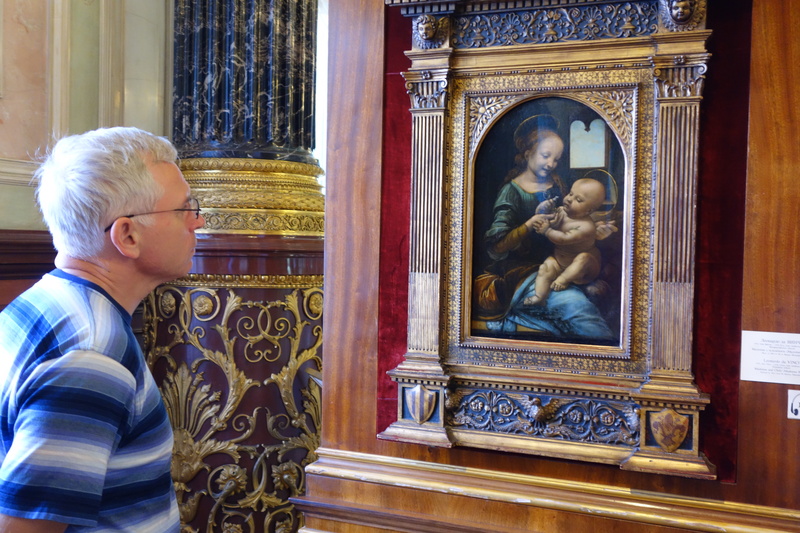 A man admires a Da Vinci (one of two) on display at the Hermitage. Seeing beautiful Russian art like this makes me stop and think about the richness of Russian heritage and the beauty of its people. Its beauty was unexpectedly alluring and ubiquitous. If I had a Russian ruble for every time I gasped at something remarkable, I’d still only have about $3, but hey–that’s 100 rubles! The Hermitage (established by Catherine the Great) was so much more than I expected. Its expansive (and perhaps questionably attained in some cases) art ranges from Egyptian antiquities to European Modern. Although we had to blitz it in 90 minutes, our guide Natalya brought it to life with her incredible insight and passion for art history. While the Hermitage offered a world-class collection, its art was most Western. 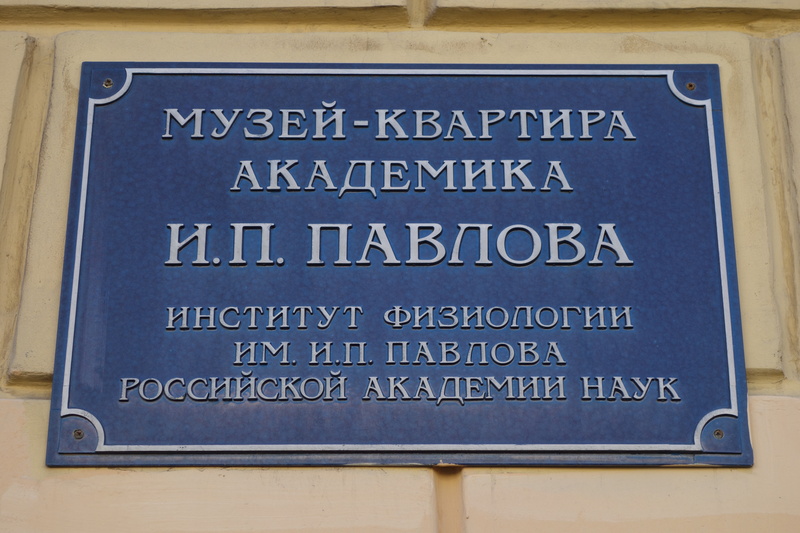 Just as impressive–but all Russian–was the Russian Museum. 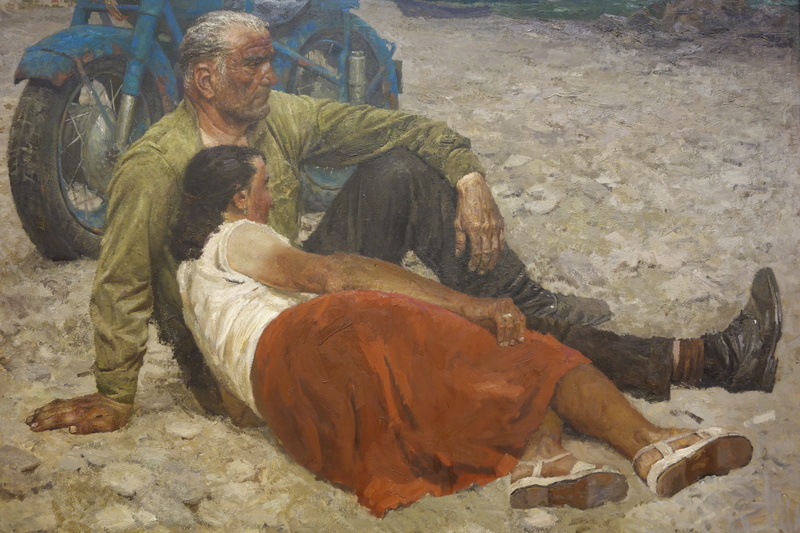 It houses a fine collection of folk and decorative art, Orthodox icons, portraitures, landscapes, and sculptures that capture the essence of the Russian people. You can discern quite a bit from how a society expresses itself through its art, and I only wish I had several hours more in there to continue my education. It was as if Russia existed in a parallel universe of art–same stages and styles but with (to us) no-name artists. And in the same way that I was visiting and getting to know St. Petersburg for the first time, it was humbling to be introduced to a world of art I knew so little about. It allowed me to gain a better understanding and appreciation of the amazing story of the Russian people. For more cultural eye-candy, check out these images that caught my attention (click on any photo to begin the slideshow). Soviet-era Ladas are popular with Uzbeki drivers. Nothing is better than fresh fruit. On a hot summer day, there’s nothing more fun for local teens than to throw buckets of water on your friends and strangers at Moskovskaya Plaza. As in most cities, people remain ever-loyal to their favorite vegetable, fish, and, honey vendors. What a juxtaposition of Russian dolls! Almost anywhere you go in St. Petersburg, you’re sure to find a great place to take a photo. The interior of the Church of the Savior on Spilled Blood is replete with exquisite mosaics. The Russian peasant class was subjected to conscripted labor and toiled to build boats and even cities. Here they are elevated to a level of beauty and compassion that art can so expertly portray. It takes five minutes each way to get in and out of the St. Petersburg metro. Imagine spending 40 hours a year just to use the metro. River-views like this are part of St. Petersburg charm. The Military Gallery at the Hemitage has hundreds of portraits of important military men. One of two rostral columns dating from 1811 that used to serve as a beacon marker for ships who came to port. Umbrellas for sale from a vending machine…genius. With this work, the Russian artists asks the viewers to ponder the hypocrisy of clergy who gorge themselves on wine and food and who claim to act in the name of Jesus yet ignore the hungry and needy. The Hermitage has a fantastic collection of art, and the palatial buildings that house it are equally remarkable. I was on of 2.5 million people who rode the St. Petersburg metro today…nearly 300 ft underground. You can find a solid collection of Post-Impressionist and Modern art at the Hermitage. Children play at Lenin’s feet. This Russian painting provides a similar, if more hopeful, theme as Eugène Delacroix’s Raft of the Medusa. A young Russian lady waits for the local bus. A soldier marches past us as we head towards the Winter Palace. Thanks, Jose. The Hermitage definitely ranks among the world’s best museums and should definitely not be missed when you go to SP. Long-held Cold War or even “semi-Cold War” perceptions about Russia seem to persist with a lot of people. But that’s one of the best things about travel: seeing a place with your own eyes and dispelling outdated and wrong-minded myths. I’m so grateful for the opportunity to have gone there. Thanks for your support and for staying up to date with Rick’s blog, too. I loved your descriptions and all the wonderful photos. This is a place I’ve wanted to visit ever since I saw an old Sean Connery movie called “Russia House”. Now I want to visit even more. Thanks for this great report. I watched the video on Rick’s site and marveled at the length of that underground escalator. Hi, Sharon! Thank you so much! I hope you get your chance to visit there. You’ll surely love it. And be sure to bring a book with you or something to occupy your time on that escalator ride down to (and up from) the metro. Fantastic photos and description of a wonderful city. I am heading to Moscow next year but hope to visit St. Petersburg soon as well. The Heritage is on the top of my list; glad to hear it did not disappoint! Thank you, Marsha. I hope you have a marvelous trip to Moscow. And when you eventually make it to St. Petersburg, I know you’ll have an amazing time. Be well, travel well. I would like to use this one: https://thetravelphile.files.wordpress.com/2013/09/dsc04159.jpg for a presentation and if applicable for a short clip. It wpuld be visibly perhaps for around 2-3 seconds.Pleaste let me know if I can get the permission, who the author is and how it is named in the credits. Hi, Michael. Thank you for your interest and courteousness. Please email me at thetravelphile@gmail.com with your request. I’m curious about the nature of your presentation and video and how the photo might be used, but I’m eager to help you out. Thanks!